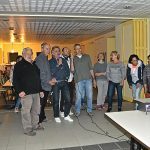 Since 2001, the association offers activities to create moments of sharing and meeting in the village of Sablières. The association bought in 2012 the equipment necessary to produce apple and grape juice and makes it available to those who wish to make juice with their harvest. Each year, in October, with your fruits and your glass bottles (Type bottle jar or bottle lemonade Collerette, the capsules are provided), the association proposes to crush and squeeze your fruits and then proceed the pasteurization of the juice. Location: at the camping “La Drobie”, by appointment only. Cost 25 cts / liter and membership of the association (15 €). The ACCA of Sablières is an approved community association of hunting created in 1969 which regroups the hunters of Sablières. Hunters actively participate in the management and protection of nature, in particular by trying to contain the deployment of the wild boar population which has increased considerably in the last 30 years (see document ). In addition, at the end of each season, the hunters plan several half-days of clearing the trails of the municipality. This allows the hunters to use them during the hunt, but also to all hikers to be able to borrow them to explore our territory. The hunting season spreads (for the year 2016-2017) from 11 September to 28 February. Party owners, Pentecost: Every year, the ACCA invites all the owners and inhabitants of the commune to share the glass of friendship. This friendly evening (aperitif, country meal, music) usually takes place on Pentecost Saturday. On Sunday morning from 9:00 am the general assembly takes place. So evening for the owners Saturday 3rd of June 2017, and general assembly Sunday 4th of June 2017. ACCA party, July: Each year, ACCA organizes a party on the last Saturday of July with a petanque contest, a meal, a dance evening. For the year 2017, it will be Saturday, July 29th. More information on hunting: in the interest of health and public safety, to prevent damage to agricultural activities and to protect other forms of property, wild boars are classified as harmful in the department of Ardeche Until June 30, 2017. Address: ACCA de Sablières, Town Hall, 07260 Sablières. Every Tuesday from 5 pm, from March to end of November. Place: petanque ground located in front of the town hall. Pétanque competition in summer open to all players. Competition between members followed by a meal at the end of the season. Theater company launched by Caroline De Metz, Patrick and Samuel Hervé, three former members of the company “Fous Sans Blancs”. It’s a modern, poetic and burlesque show. There are the great Cid tirades played by three improbable characters: a scout, a security guard and an explorer, who are obliged to play several roles in order to complete their play in record time. The staging creates situations as hilarious as dramatic. The show lasts about 45 minutes. Their first creation “Le Cid, at three, in fifteen minutes or so” is on tour and will be played at Sablières on January 22nd, 2017. Patrick, Samuel and Caroline plan to integrate new people for the second show. To this end, they will offer theater workshops. The Beaume Drobie’s valley APE is the association of parents of the public intercommunal school (Dompnac, Sablières and St Mélany) located in the village of Dompnac. A single class school from kindergarten to grade 2, with a teacher for the CP-CM2 and an ATSEM (Kindergarten Specialized Territorial Agent). The APE aims to organize events (cinema, school newspaper, raffle, meals, concerts …) open to all, to the profits of the school to ensure the pedagogical and cultural outings organized by the teacher throughout the year. Indeed, being a small school, the three communes are represented by the SIVOS which ensures the operating costs of the school and also a part of the transport but can not take in charge the totality, that is why the APE is mobilized throughout the year for the welfare of the school and children in the valley.